What Happens If You Make a Passport Application Mistake? Nobody’s perfect, and we all make mistakes. But what if you make a passport application mistake? If you have made an error on your passport application, you’ll have a very different experience if you have applied through the post office instead of through G3! Passport applications can be complicated. That’s why we have a team of passport specialists available to answer all of your questions. Mistakes can still happen, though! Here are some of the more common mistakes we see on passport applications. Typos and misspellings. It’s easy enough for your fingers to slip on the keyboard, resulting in misspellings. A misspelled name can be a real problem on a passport application. Transposed numbers and dates. If you’re filling out your application in a hurry, you might not even notice that you listed your birthday as 12 June instead of 21 June. Incorrect information. Did you put your son’s Social Security Number on your daughter’s passport application? Or did you list your dad’s place of birth as Cleveland instead of Cincinnati? These are the kinds of incorrect info that we sometimes see on passport applications. Signature errors. There are a lot of ways you can inadvertently mess up the signature part of your passport application! If you are applying for a new adult passport, a minor passport, or a replacement for a lost or stolen passport, you will need to sign the application at the Passport Acceptance Facility. If you signed your application at home, your application won’t be accepted, and you’ll need to fill out a new one. Passport applications for renewals or second valid passports can be signed at your home or office, but you will still have a problem if you use a purple pen or sign your nickname! Passport Application Mistakes – A Headache If You Apply Through the Post Office! It’s estimated that 25-30% of passport applications submitted through the post office have mistakes or missing documentation. If you send in your passport application through the post office, and there’s a mistake, the Passport Agency will put your application in “suspense.” This means that it is on hold until the error can be corrected. The Passport Agency will send you a letter via First-Class Mail explaining the problem. It can take 2-3 weeks for them to contact you, and you’ll then have to send in a new application or whatever item they were missing. A passport application mistake can cost you weeks of delay if you submit your application on your own through the post office. When you need your passport in a rush, you don’t have time for a passport application mistake. That’s why our passport specialists take the time to talk to you about the application and all the requirements. We also do a review of the application packet when we receive it. We can catch passport application mistakes before they are submitted to the Passport Agency! If there is a problem after your application is submitted to the Passport Agency, they tell us about it right away. Most issues can be resolved within two days, so your passport application won’t be slowed down. 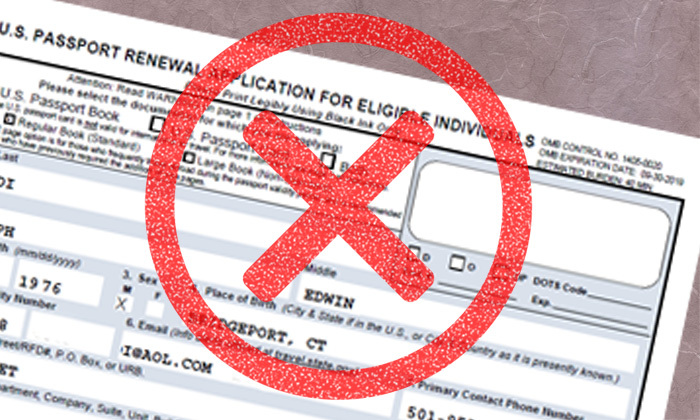 We don’t want a simple error on your passport application to keep you from your travels!